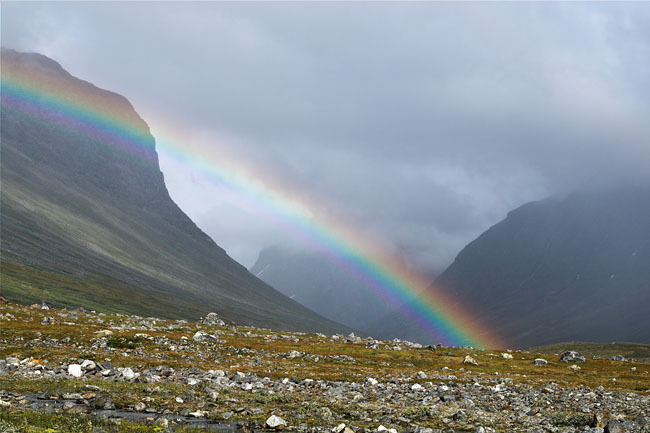 A rainbow is beautiful when on a photograph, while it's immediate practical consequences are much less appreciated by the photographer. At least it involves sunlight and it does not rain permanently. 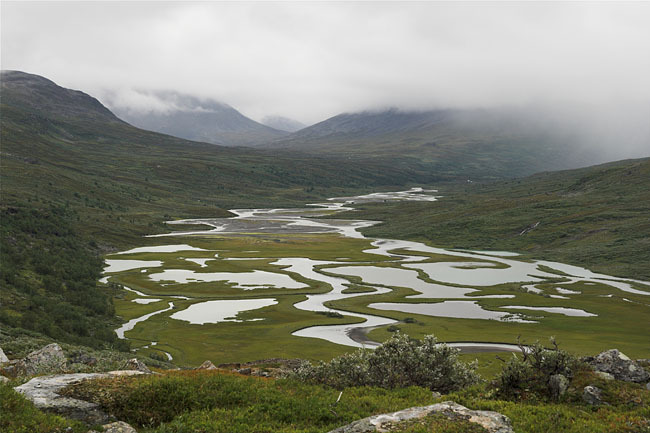 As it concerns Sarek, these two pictures deliver a typical taste of what one has to expect during a tour - high precipitation, seasoned with low temperature and wind. 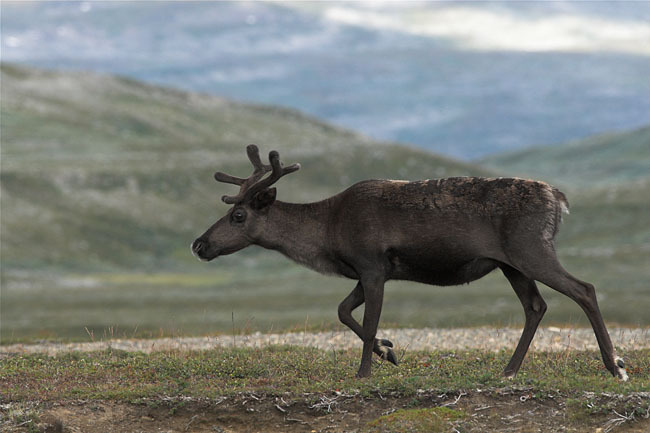 The Sarek's tundra is an ideal habitat for reindeers. 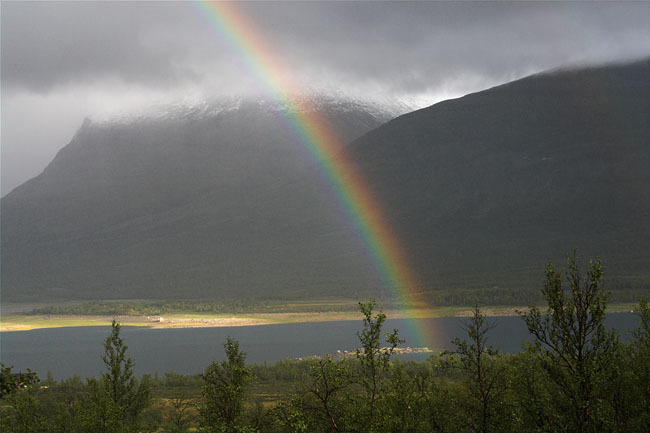 Many of them are earmarked by local people, the Sami. 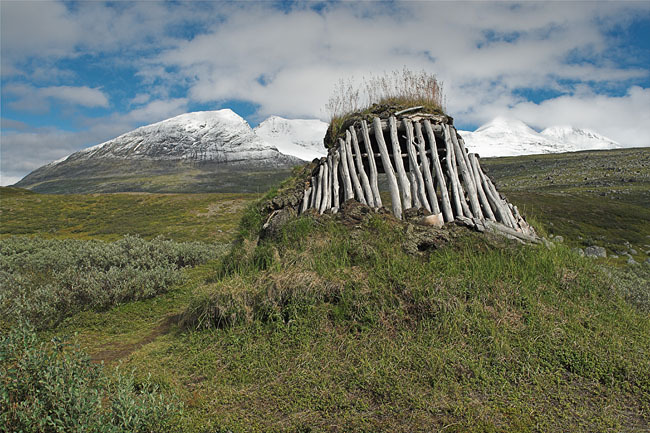 The remnants of an old hut build by Sami people. 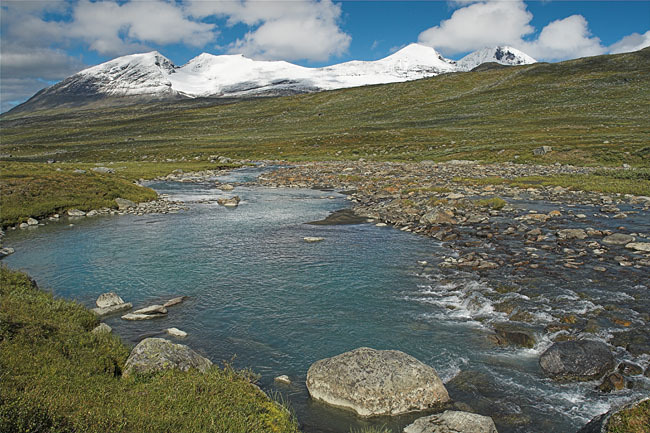 The small stream Suottasjjåhkå with the mountain Áhkká in the background. 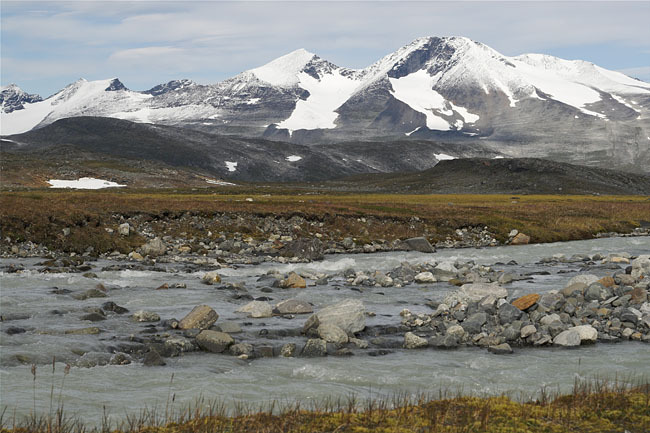 The isolated mountain massif of Áhkká (2015 m) is very impressive. 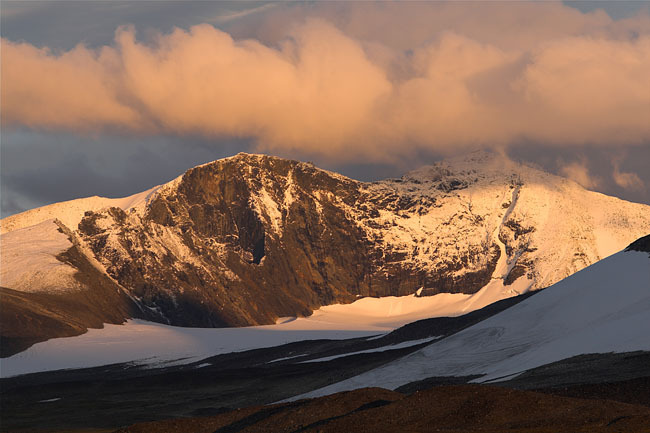 Fresh snow covers the higher terrain in the middle of August. 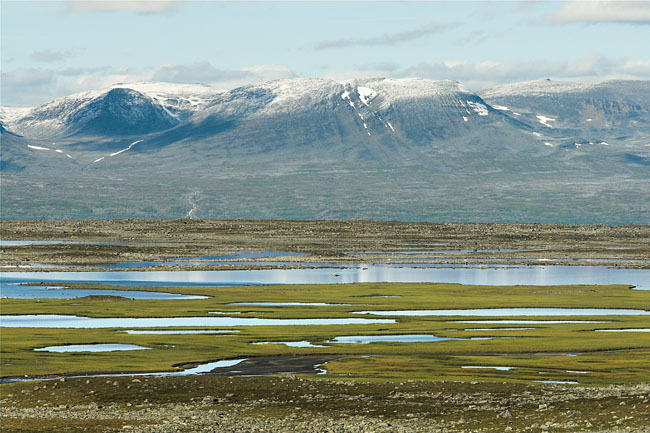 The view goes to the northeast, over a wide plain and then across a deep valley filled with a lake to the next mountain chain. The same view, but from the opposite direction, now showing the waters of Akkajávrre in the evening. 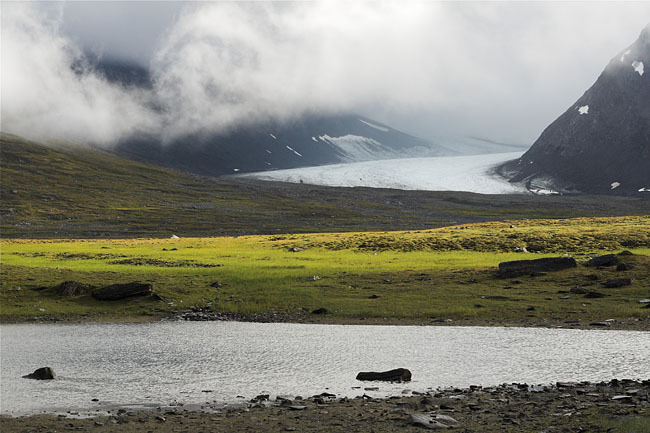 One of the many glaciers in the Sarek NP, the Suottasjjiegna. 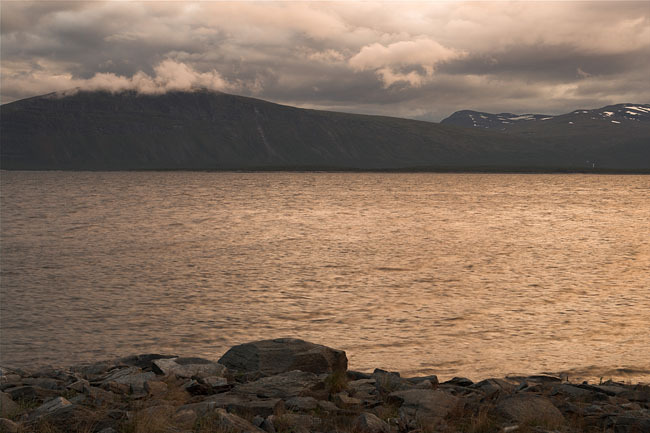 From the slopes of Vuojnesvárásj to the Bierikjávrre, a lake at 801 m.
The Bierikjávrre from the campsite on the next morning, while the clouds are getting darker and lower. 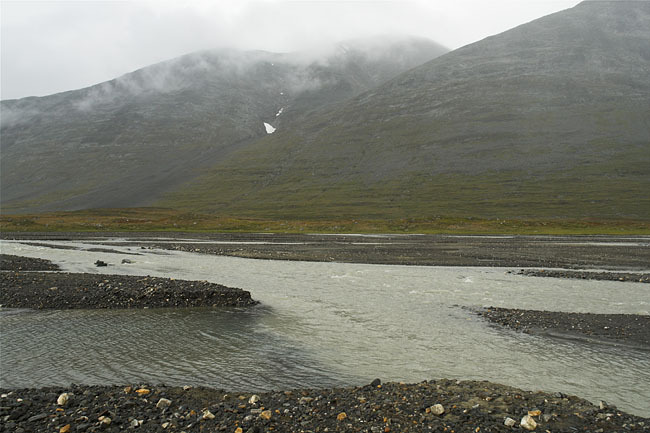 The Gálmmejåhkå at the exit of the Álggavágge. 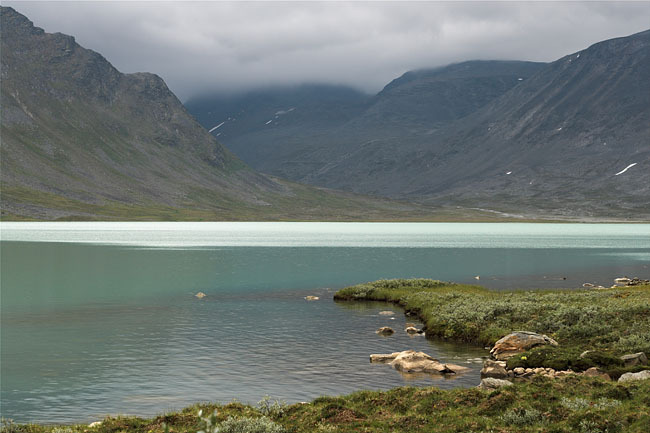 The Guohperjåhkå or the Rahpajåhkå, lots of water that changes its name quickly. 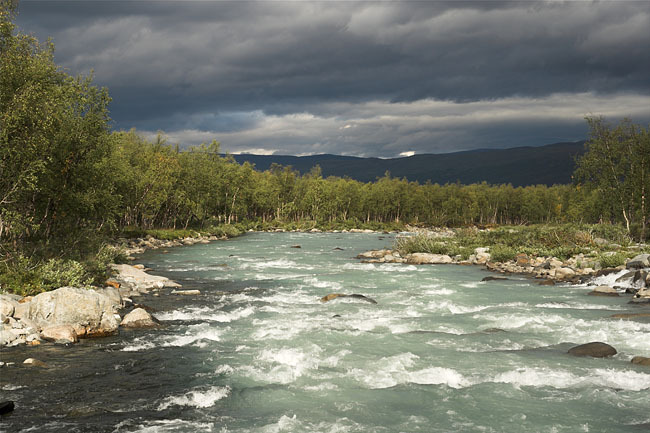 The river becomes bigger and famous under the name RÁhpaädno in the Rapadalen. There's nothing you can do about the weather. 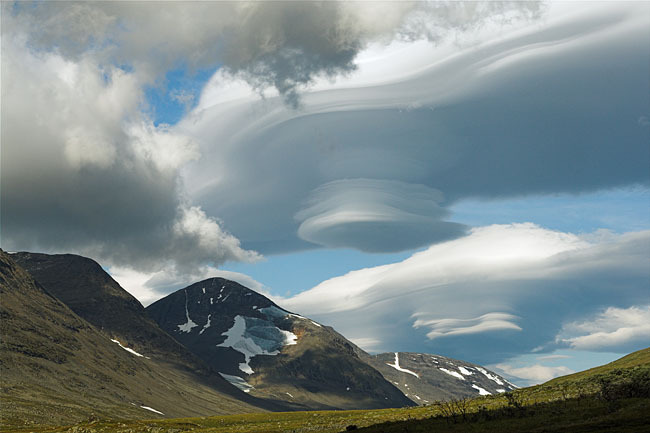 Confronted with lots of rain we at least had the opportunity to photograph some good clouds, with luck lit up by the evening sun or Enterprise-like with Ambassador Sarek on board. 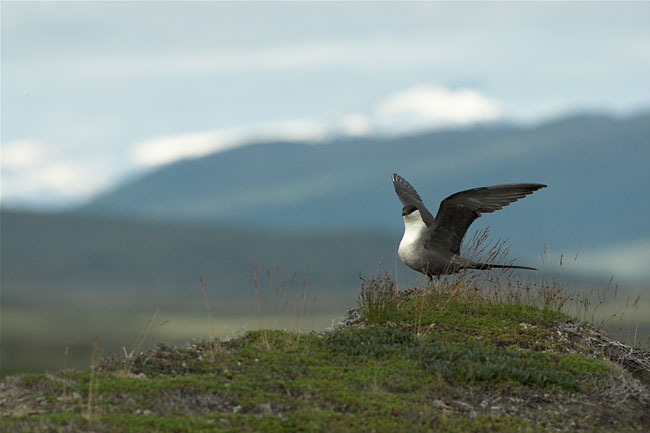 A Long-Tailed Skua, also known as Long-Tailed Jaeger, in take-off position. Not a bird of prey as it seemed at first from afar. 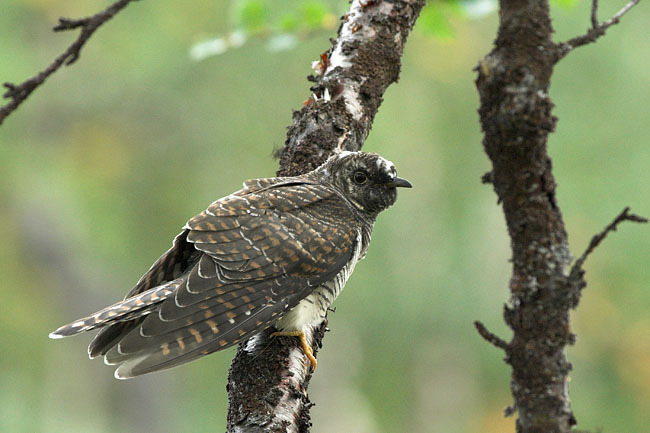 Just a "Common" or European Cuckoo. 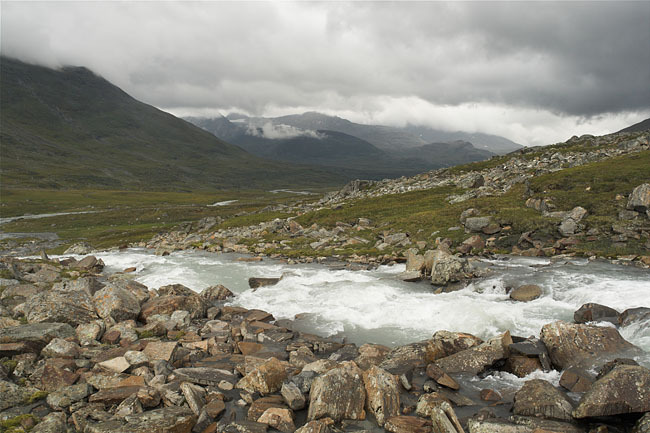 In spite of the rainy weather the rivers were easy to cross, if in the right places, like the Smájllajåhkå in the Ruohtesvágge (left). A small lake in front of the Oarjep Ruohtesjiegna, and a rare spot of sunlight. 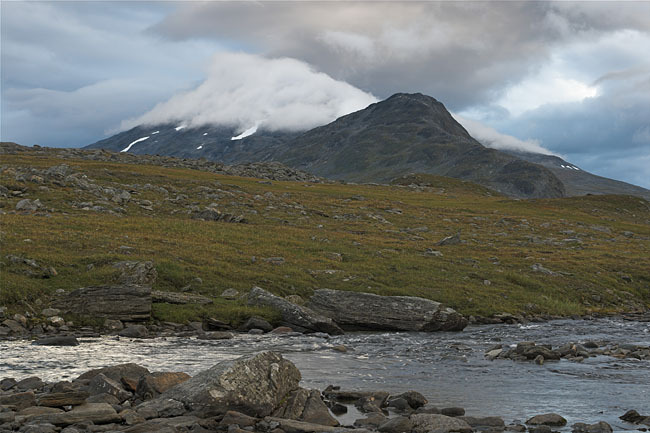 The mountain Gisuris (1664 m), topped by a "personal" cloud, all behind the river Nijákjågåsj. 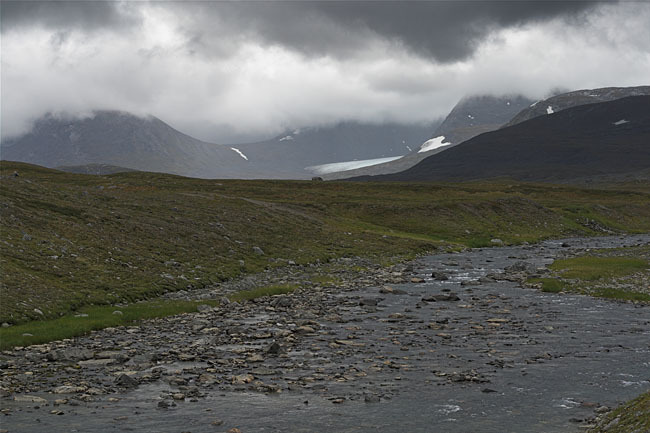 A look upstream along the Nijákjågåsj with the Oarjep Ruohtesjiegna glacier still in sight. 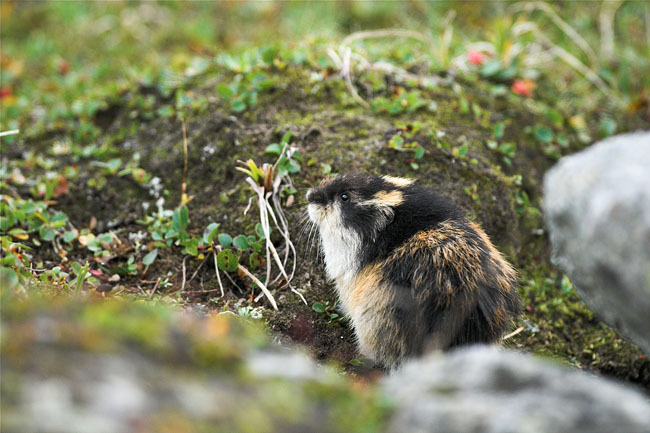 The presence of a great many of these small rodents doesn't make it easy to take pictures of them. The smaller the animal the quicker it moves. Way worse than a lemming from a photographer's point. 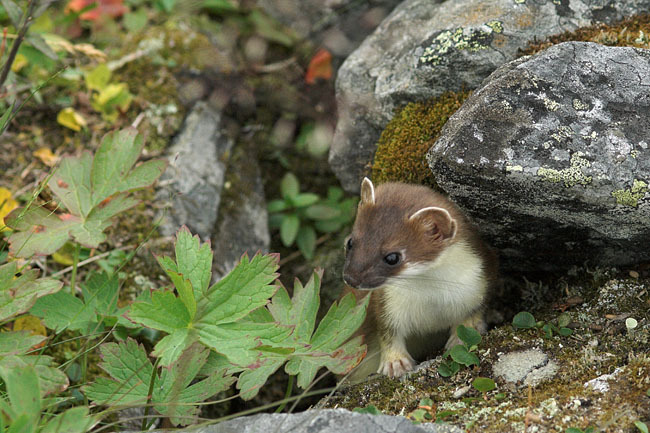 Time seems to run faster for this ermine weasel, which was running back and forth to maybe protect it's home, stopping only for bits of a second. 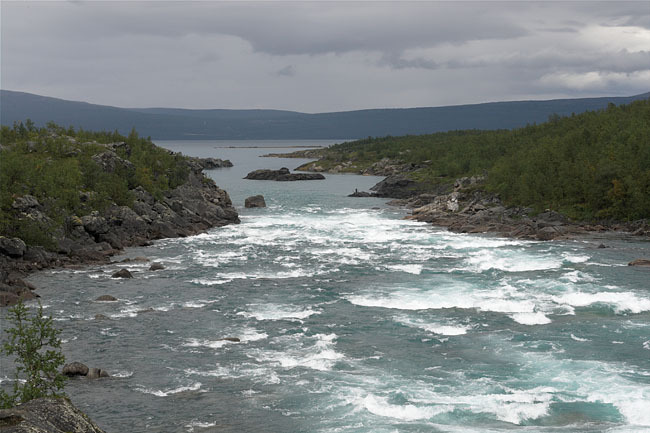 ...biggest rivers of the area, the Vuojatädno, which in turn feeds the long lake behind the Suorva dam, built in 1972. 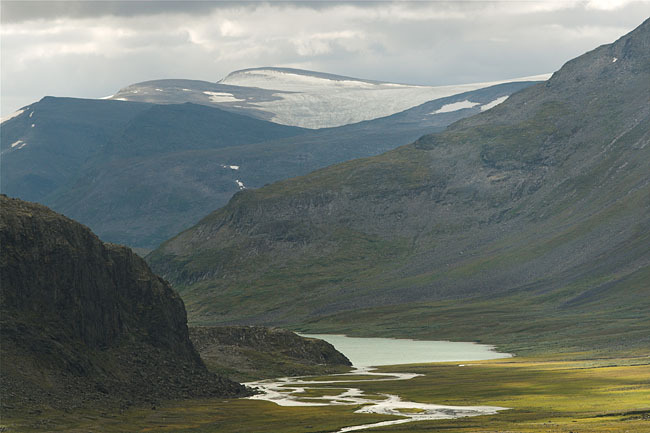 A view along the river Guohperjåhkå to the west.